This summer is everywhere extremely hot. Also in the “moderate” Swiss these last months have dramatically shown high temperatures well over 30°C and basically no rain. A lot of countries in the northern hemisphere are literally burning, devastated by severe fires. The same risk is present also in the small Confederation. Therefore the population shall be diligently informed by all possible means. One simple way is by attaching small A4 panels with rubber tape at any bus stop, reminding the people that the “fire hazard level” is 5 (out of 5)! There is absolute fire prohibition from the 30th July 2018 at 17:00! Special behaviours shall be observed concerning open fires in the forests or BBQ equipment: simple safety rules pointed out in an easy, graphical and colourful way. Even if the panel is not so big, you are attracted by such strange announcement and… you cannot help but reading it! 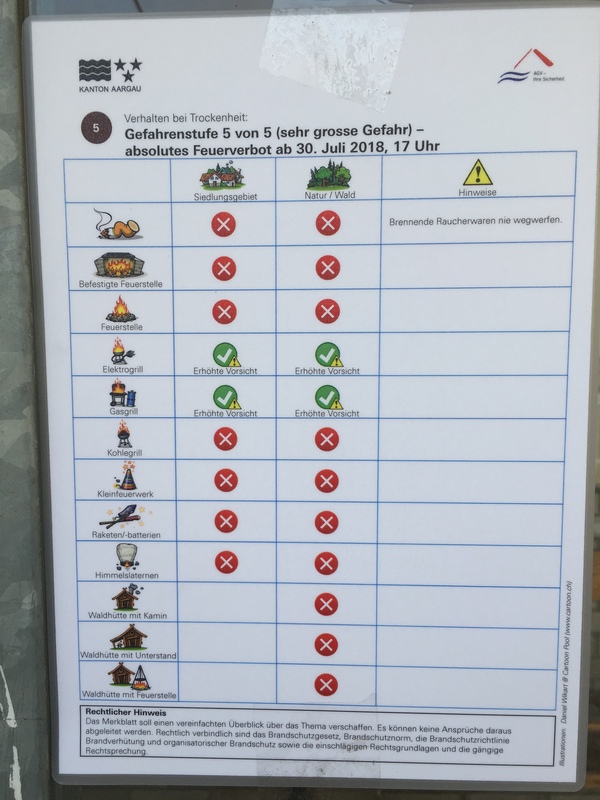 That’s Switzerland, that’s the safe way to prevent dangerous fires in a very dry summer season!